It’s that time of year again, when we congratulate our transatlantic cousins on winning their freedom from the tyranny that a government in Westminster was inflicting on them. A delightful parallel, though perhaps not an entirely accurate one. Back then Americans were exiting Britain, rather than Britain exiting anywhere. It was really more of an Amexit. They did it to get away from control by Westminster. Today’s Englishmen, on the other hand, voted in their wisdom for Brexit, ostensibly to strengthen Westminster’s control. With growth halted and living standards falling, they may soon realise that such control is, in practice, as uncomfortable to them as it was to those American Englishmen 241 years ago. For Englishmen they were. Champions of English rights. None more so than Thomas Jefferson, who drafted that Declaration of Independence for which we’re celebrating the anniversary today. There they enjoyed rights derived from their “their Saxon ancestors”, which by transmission they continued to uphold in America. Here he showed scant regard to the sometimes contradictory rights of the people who already lived there, but then he spared scarcely a thought for the liberties of Native Americans: no one, on either side, ever did. The document is, however, strikingly short on the rights of black people. Jefferson’s colleagues thought that was perhaps too much of a good thing, as they founded a nation based on human rights including the right to own other humans. So they struck out this passage. It’s also a tad ironic that Jefferson himself had slaves, fathering several children on one of them. And talking about people capable of bearing children, women were wholly absent from the process of declaring independence. Now that’s the kind of commitment to universal rights which would have struck a chord in England too. The Executive trying to impose its authority on the judiciary? That’s certainly the hallmark of tyranny. But isn’t that just what the Donald would like to do? Sometimes I can’t help feeling that in George III the American people had a ruler as bad but no worse than the one they’ve elected now. 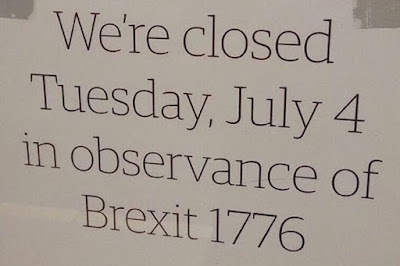 July the fourth: is it slightly a celebration of leaping from the frying pan into the fire? Or to put it another way, misquoting that excellent film Brassed Off, if Thomas Jefferson were alive today, he’d be spinning in his grave. Austerity: is it really a Tory blind spot?